20% Off for Earth Day! Pivot, A Memoir - Perelandra Ltd.
"Just finished it today. Wow. All I can say is wow. There are NO limits. Beautifully done, I am so inspired." "What a Life! I thank Machaelle for this book and for the life and Life it represents. The new book dovetails well with, but does not replace, her three earlier biographical books." "I have just completed Pivot and I must tell you that for me, it calmly and beautifully pulled together much of your information I have read over the past 35 or more years. It gives me the impetus to retry some of the things I have attempted in the past. I will try MAP again. I have pulled out my first edition copy of The Mount Shasta Mission which I shall now reread with renewed understanding and greater appreciation. Thank you for writing Pivot." "Just finished reading Pivot. I am BLOWN AWAY!! A whole new appreciation for the work being done. Still trying to wrap my head around some of it, but overall, I am in awe, humbled, and feeling like I have a lot of work to do! Thanks, Machaelle, just isn't enough to say." 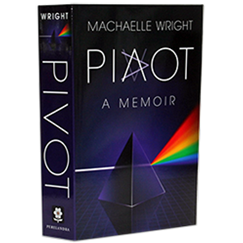 "I had my mind blown by Machaelle's book, Pivot. It's absolutely stunning. Now I think I'm ready to start working with PIC and the Soil-less Garden Companion book." If you would like to share your experience and thoughts about Pivot, you can easily do so on our website. On this page, there's a tab that says, "Customer Comments." Open that tab and scroll down to click the link that says, "Review and Rate This Item." You can take it from there! We were lucky enough to be among the first who read Pivot. It opened our minds and hearts to a better understanding and appreciation of our lives, our world and the universe beyond. Prefer to read a little before you go "all in"? You can now read an excerpt from the beginning of Pivot online here. In fact, you'll find free excerpts from all of Machaelle's books free online here. And when you're ready to add a whole new layer of understanding to the adventure of Pivot, check out this special series of photo galleries Machaelle has put together for everyone: Machaelle's Pivot Scrapbook. Once upon a time one encounters a person who lives their life on purpose. As a grateful reader, my own preconceived notions and mental models were challenged as I read Machaelle's story. From her young life in Maryland, unconventional 'family,' Catholic school, European 'gap' year, to Capitol Hill ... and beyond, my respect for her increased. A wonderful read full of info that I will frequently return to. Thank you, thank you, thank you. on 11/3/2018 What a Life! I thank Machaelle for this book and for the life and Life it represents. The new book dovetails well with, but does not replace, her three earlier biographical books. The earlier books have the advantage of speaking in the voice of one who is still going through and processing what is being discussed. The on-the-ground perspective of the earlier books has been invaluable to me, as I go through my own adventures, to show me the range of what kinds of things can happen and what kinds of daring might be required. The new book on the other hand provides a deep and unified view. The light from the unified view illuminates many corners that were left unaddressed before. And the combined life energy that emerges from the consistent view is breathtaking, inspiring, profound. The first half of the book, up through the end of Pivot One, is a classic memoir of an extraordinary yet ordinary life. Even on its own, I found this part very worth reading. My human sense of timing did wonder a bit.